Second Place: Need Supply Co. 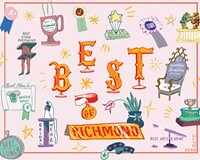 In terms of high-quality Richmond fashion options, all roads seem to lead to Cary Street. Located in the heart of Carytown, Pink has a stated commitment to "collect the very best of each season, pieces that mix seamlessly from one year to the next." Since 1987, it's been a valued resource for women's clothing, shoes, jewelry, handbags and accessories. Pink is open Monday through Saturday from 10 a.m. to 6 p.m., and Sunday from noon to 5. You can also follow the store via Twitter and Instagram, or its blog, which highlights new collections. "We honor our vision by providing women with an individual and ever-evolving sense of style and confidence through personalized and genuine service," owner Libby Sykes says. Need Supply, located on West Cary, has been in Richmond since 1996, and has been named one of the 100 best denim stores in the world by Nylon Magazine. It also offers both men's and women's outerwear, shoes and accessories. Rumors Boutique on West Broad Street buys, sells and trades lightly used, in-style and vintage clothing, and maintains a Tumblr site.